Do Online Colleges Require the Completion of Internships? When most students enroll in an online degree program, they make the assumption that there will be no real “offline” involvement required in order to obtain their degree. Aside from homework, this is certainly the case for some programs. Even so, many online universities and degree programs require students to seek out internships for online college students that will give them valuable work experience before they become part of the active job market. This requirement is not taken lightly, and many schools go through great pains to verify that their students are seeking the experiences and training they need to become a post-graduation success story. The great thing about college internships, whether they’re part of an online degree program or an on-campus program, is that they typically count as at least one elective course for undergraduate students. That means it’s possible to use the internship as a pass or fail grade, reducing a student’s real course load and homework responsibility while giving them more time to focus on their studies. Perhaps even better is the fact that many internships do pay students for their on-the-job activities. Most of these opportunities come with an hourly pay rate for hired students, doubling the advantages of receiving college credit for the job. Online colleges and universities are just like their offline counterparts when it comes to verification of a student’s employment with a paid or unpaid internship opportunity. Upon landing an internship, students will need to get the placement approved by an advisor or by the school’s dedicated internship office. If approved, the student will generally be granted college credit. If not, they’ll need to find an opportunity more suited to their studies. Students will typically have to make weekly reports regarding their internship, usually in the form of a small written paper or student journal. This replaces the typical 1-credit “lab” that most conventional universities require their students to attend on a weekly basis when they have an off-campus job placement. 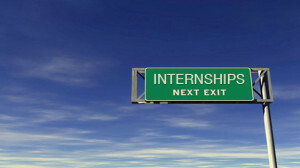 An internship requirement should never be perceived as intimidating or impossible. Despite their online nature, distance learning institutions have a number of tools for students to use. This includes school-specific online job boards, networking with certain companies nationwide, or even the use of private internship databases that span the globe. In some cases, students who already work in a related field while pursuing their degree may actually be able to cite that position as an internship and gain credit for their on-the-job efforts. This merits discussing with an advisor or internship expert at the school before pursuing opportunities elsewhere. Though online schools are non-traditional in virtually every way, the internship requirement is a practical and pragmatic way for students to boost their employment chances after graduation and gain real experience. For this reason, it should be considered a real benefit of choosing an online degree program rather than an intimidating prospect. When in doubt, be sure to use the full extent of a school’s resources, such as career counselors, when researching local opportunities or citing an existing job as a qualified internship. With appropriate planning and institutional support to find the perfect internship for online college, students everywhere will graduate with the experience they need to be a real success in the workplace.